Over the past 25 years, the face of Florida families has changed dramatically. As a result, there are more grandparents raising grandchildren and aunts and uncles raising nieces and nephews. Adult siblings are stepping up to adopt and raise their younger siblings. It’s only logical that the mechanics of adopting a child and the Florida relative adoption process be in tune with these changing times. In Florida, private (non-DCF) adoptions are governed by Chapter 63 of the Florida Statutes. Can I adopt my relative without an attorney in Florida? Yes. While there are many types of adoptions, the legal process for relative adoptions in Florida under Chapter 63 of Florida law was created to provide expedited and simplified family adoption procedures for adopting a child by relatives. The best part about this is that a Florida relative adoption can be economical, because you don’t have to pay attorney’s fees if you choose to do it pro se (without an attorney). But just because you decide to do it on your own doesn’t mean that you have to do it alone. There are options available to help you achieve your relative adoption goal. Who qualifies as a relative? Florida Statutes, Section 63.032(16) states that a relative “means a person related by blood to the person being adopted within the third degree of consanguinity”. This means that the child must be within the third degree of relationship to the adoptive parent. 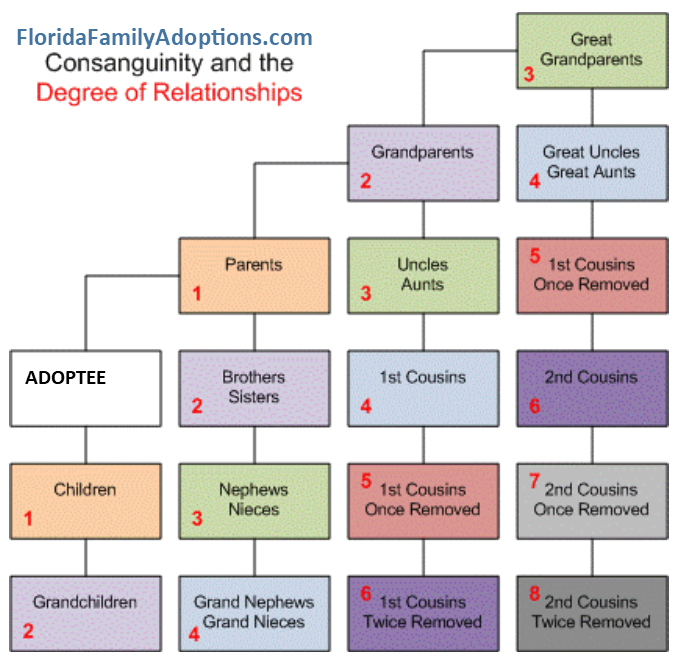 The following chart provides a table of relationships used in Florida relative adoptions. If you are a relative that falls outside of the third degree of blood relationship from the relative you wish to adopt, you will NOT be able to complete a Florida relative adoption without fulfilling additional requirements, and you will need an attorney to process the adoption. Do I need a home study for a relative adoption in Florida? No. Generally, a Florida relative adoption under Chapter 63 does not require a home study, which makes it easier and more affordable for a relative to adopt in Florida. Will the court process my relative adoption paperwork if I don’t have an attorney? Yes. If your Florida relative adoption documents are properly prepared, signed and notarized, and you have paid the court filing fee (or obtained a waiver) the court must accept your pro se adoption case and process it. Are Florida relative adoption forms available online? No. While you can find some (but not all) step-parent and adult adoption forms online, there are no Florida relative adoption forms available online for use by the general public. Can I use Florida step-parent adoption forms for my Florida relative or grandparent adoption? Although some clerks of court will tell you to use step-parent adoption forms for your relative adoption (and modify them), you are being unintentionally set up for failure. Using improper adoption forms for your Florida relative adoption case can have disastrous consequences, as these processes are different one from the other, and the wording and requirements for each of these adoptions varies. I can’t afford an attorney. Where can I find help filling out the documents to adopt my relative in Florida? A Florida grandparent adoption or other Florida relative adoption is a life-changing event that should be carefully considered. Adopting your relative in Florida should be simple and affordable. As surprising as it may seem, there are alternatives for you to consider when adopting your relative in Florida that won’t bust your budget. Florida Family Adoptions was created to assist families just like you. We provide a Florida relative adoption forms packet that is properly completed using the information that you provide in writing using our online questionnaire. If you need legal advice, you should consult with a licensed Florida attorney. Your office is not in my county. Aren’t you too far away to help me? No. We will meet with you personally anywhere in Florida to deliver, sign and notarize your Florida relative or grandparent adoption documents. We will also provide you with procedural assistance, such as filing your relative adoption case in court, as well as ongoing practical and emotional support as you navigate through this important process. We can meet with others as necessary including birth parents (biological parents) and other family members. Can you give me legal advice on adopting a child or go with me to court? Stay tuned for upcoming posts on how to save costs on your Florida relative, step-parent or adult adoption; the Florida Putative Father Registry; Avoiding Florida Adoption Pitfalls as a Pro Se Petitioner; Breaking the Myths about Florida Step-Parent, Relative and Adult Adoptions, and much more. Please visit Florida Family Adoptions for more information about how to get started.